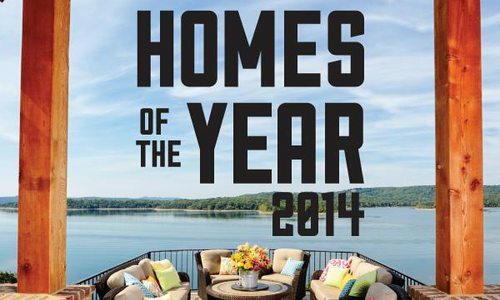 Each year, we ask 417-land builders to submit their best work. That invitation unfailingly results in a diverse array of drop-dead gorgeous homes for us to drool over. 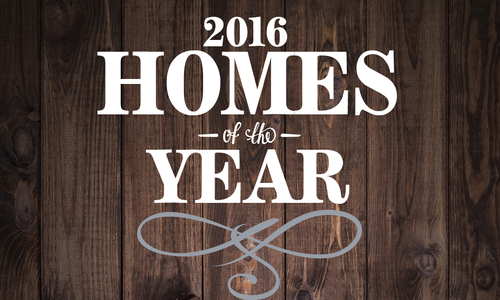 Each year, we ask 417-land builders to submit their best work. That invitation unfailingly results in a diverse array of drop-dead gorgeous homes for us to drool over. This year’s batch of impressive projects was no exception. 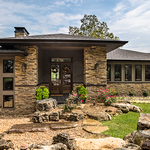 To help us determine the cream of the crop, we turned to Home Builders Association of Greater Southwest Illinois, who were blown away by the craftsmanship, expertise and creativity they saw on display in this year’s entries. Challenging as it was, the judges whittled down the nominations to a trio of top-notch projects with designs and features that set them apart from the pack, like dramatic floor-to-ceiling fireplaces, envy-inducing kitchens, gorgeous decks perfect for drinking in the surrounding scenery and much more. 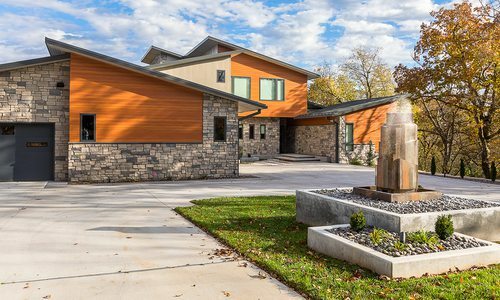 We delve into the backstory behind how these builders and their teams made their clients’ dreams a reality and what you need to know before diving into a custom home project of your own. 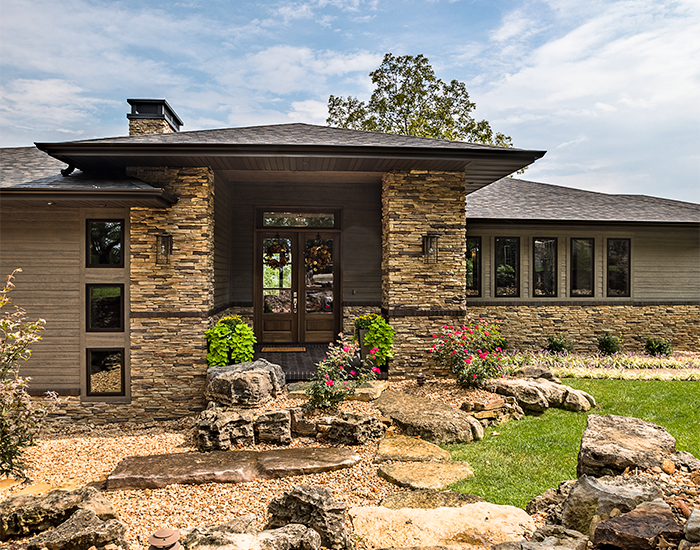 A fter relocating to 417-land in 2008, Gary and Mickey Dorland enlisted builder Thom Holman for a large, gorgeous home near Shell Knob. But another move was in order when the couple realized their life revolved increasingly around Branson. So, they called on Holman once more to execute a custom home on a spectacular lakeview lot the couple discovered. “We knew we were sizing everything down, and I wanted to leave them as happy when we built this house as when we built the first house,” Holman says. Featuring a 60-foot drop, the lot presented special challenges and opportunities. For example, the steepness necessitated working with a professional surveyor and 3-D topographical maps to ensure the home’s stability and functionality. And the design—conceived by Jason Thompson of J.L. Thompson Design—showcases dramatic views from the main living space on the top floor, as well as the guest bedrooms on the floor below. Although the vistas are stunning throughout the house, they are perhaps best admired from the central first-floor living space, where the kitchen, sitting area and dining space come together in an open floor plan. 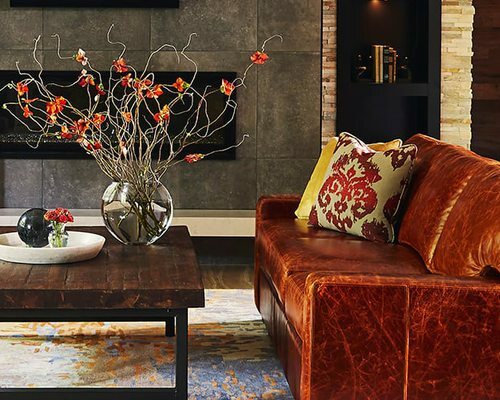 Featuring contemporary materials and colors juxtaposed with rustic elements like dark-stained woodwork, this stylish gathering place is one of the home’s main showstoppers. “When you walk in and your eye naturally goes right across the lake, and then you look the length of that room to the fireplace, you just go ‘wow,’” Holman says. 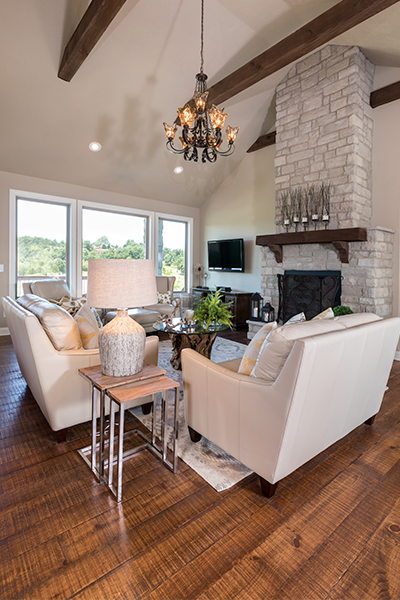 With plenty of room and flexibility for entertaining, the main living area allows groups to gather comfortably. Thompson’s plans created some separation within the room with varying ceiling treatments. 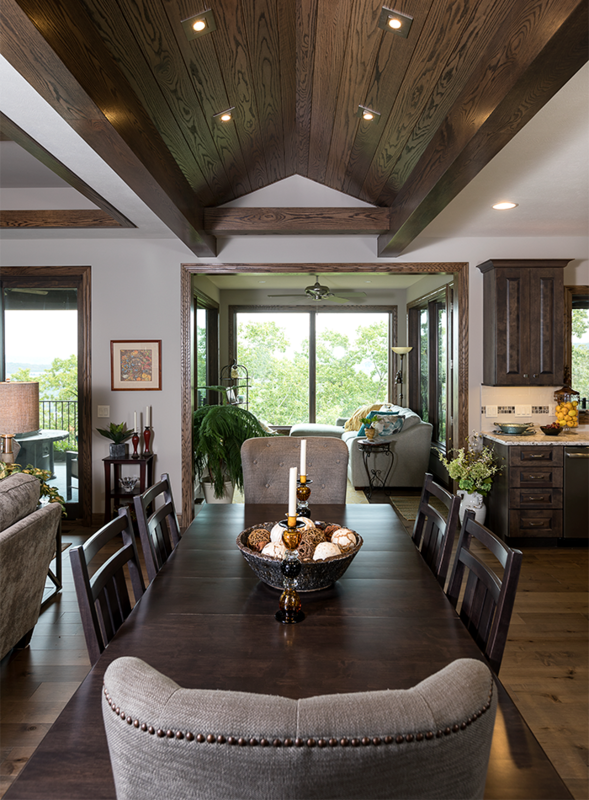 For example, there are rustic beams in a square tray above living room, and the ceiling above the dining area is vaulted to echo the shape of the dining table. Meanwhile, the kitchen is delineated by cool, contemporary pendant lighting. The dramatic fireplace provides an eye-catching focal point in the open, high-ceilinged living space on the first floor. 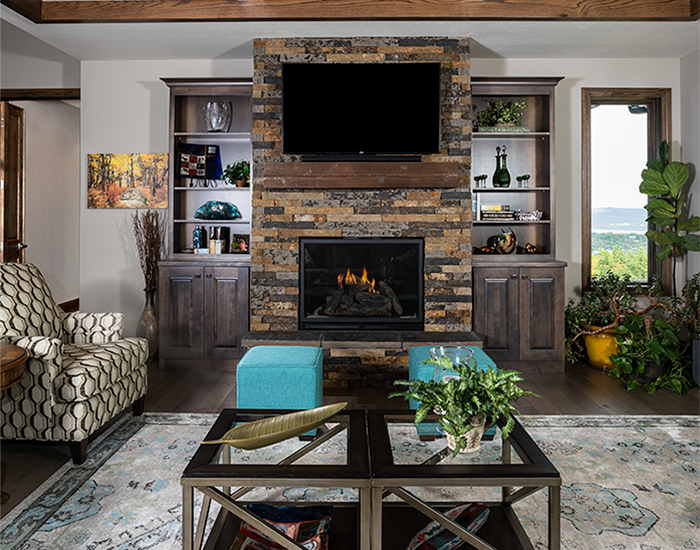 It features a natural stone veneer with a concrete mantel that’s made to look like wood. 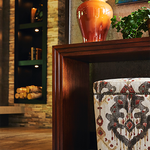 That mantel material avoids fire hazards without sacrificing style. Modern touches like dark windows and natural materials like stacked stone are contrasted, mirroring the contemporary combination of elements inside the home. The distinctive exterior also features prairie-style elements like long, horizontal lines and a relatively flat-pitched roof with overhanging eaves that extend out roughly three feet. 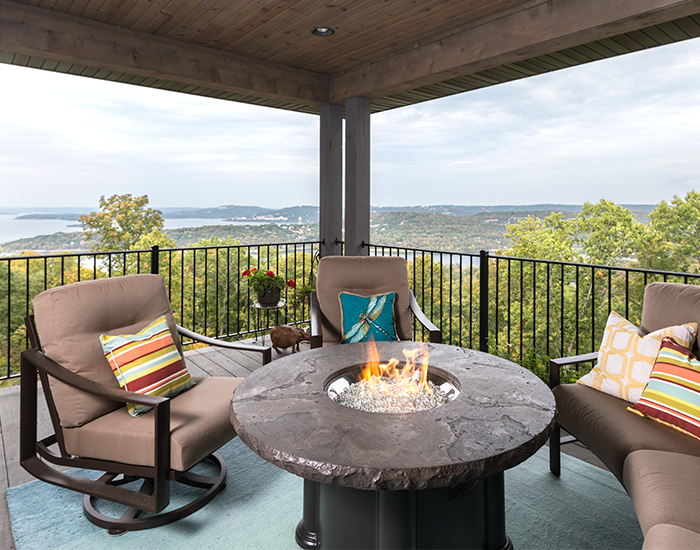 Home to comfy seating and a fire pit, this is one of three porches on the back of the house. Two others include an enclosed sunroom with nearly floor-to-ceiling windows and a screened-in porch where the homeowners can eat and enjoy the scenery without bugs hampering their comfort. 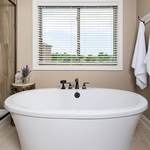 A main feature of the master bathroom is the large walk-in shower, which also has views of the lake. 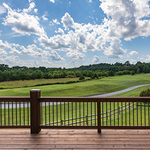 That view can also be enjoyed from a deck adjoining the bathroom featuring privacy screens and a hot tub. “They can walk right out of their bathroom, sit in their tub and look all the way down to the lake,” Holman says. The kitchen reflects the home’s balance of styles. 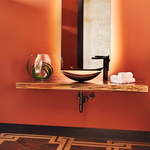 For example, modern chrome cabinet pulls stand out from the rustic, dark-stained wood of the cabinetry. “The combination of the rustic trims and beams, along with the contemporary colors and chrome, really was awesome,” Holman says. The Dorlands enjoy hosting friends and family, which was a key consideration in determining the layout and design of the kitchen. For instance, the kitchen has dual dishwashers for easy clean-up after get-togethers, plus a large quartz countertop allowing plenty of room for seating. For Julie Miller and her husband, building a new house was all about creating a space that worked for their modern-leaning tastes and lifestyle, which includes frequent entertaining. To accomplish that, the couple assembled a team including builders Keith McKee and Justin Adkins, a family friend. The duo had worked together in previous years and linked up once more for this special project. “We just work well together, and we always have,” McKee says. 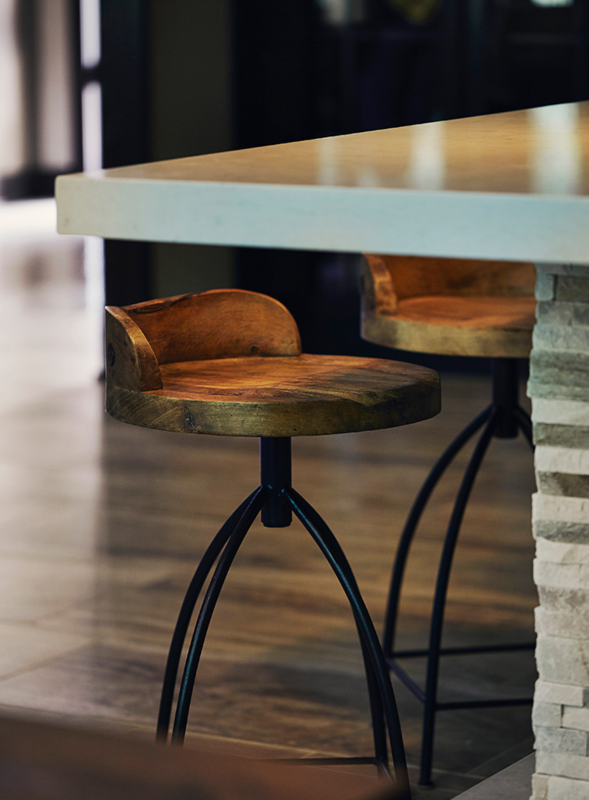 Builders Keith McKee and Justin Adkins worked closely with interior designer Erica Lea Hendrix and architect Geoffrey Butler to customize an open, functional space. 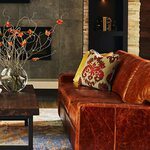 Executed in a modern aesthetic that was warmed up with rustic materials, the home includes standout features such as the sleek, stunning fireplace and walls covered in reclaimed walnut. 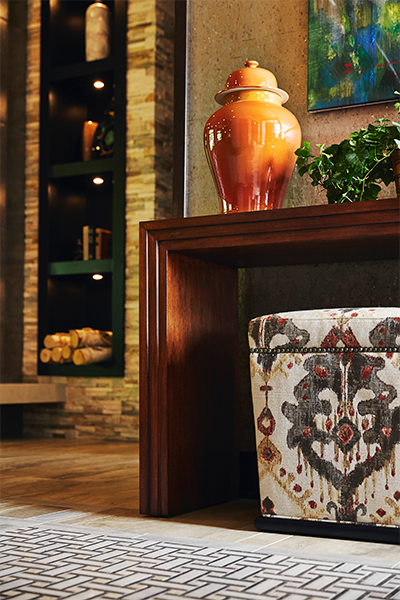 Throughout the home, the team kept the color palette neutral for any of the fixed pieces and major bones, allowing punchy pieces to pop, like the urn and pretty patterned ottoman in the entryway. “In order for the room to not be drab, we added color in fabrics and in some accessories, and it really livened up the space,” Hendrix says. Inspired by a photo the homeowners liked, the exterior draws on the prairie style pioneered by Frank Lloyd Wright. It has long, clean lines thanks to a variety of elements like Norman brick, which has a slimmer shape than other types of brick. Every six courses, the bricks are pushed in about a half an inch, which adds an appealing visual element to the facade. “It has this nice, linear look,” Adkins says. 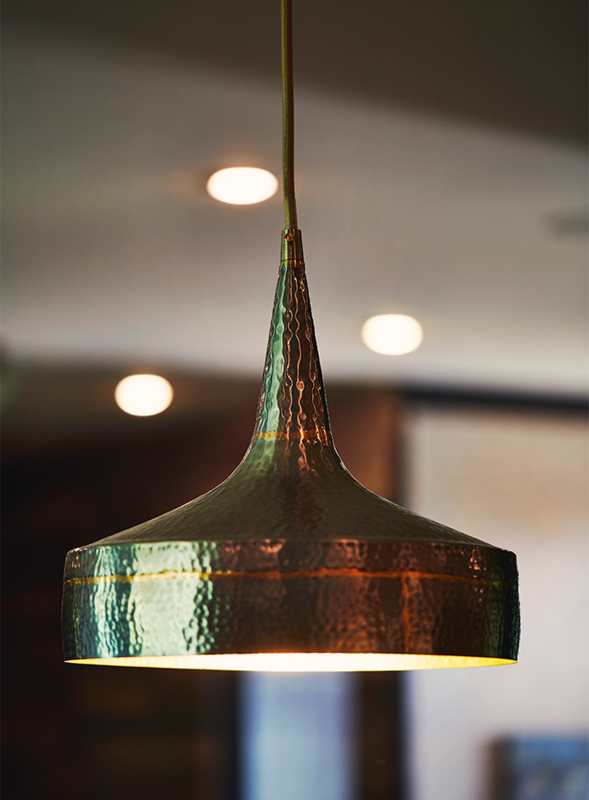 Hendrix added pops of metallic in the kitchen and dining area with hammered metal light fixtures. 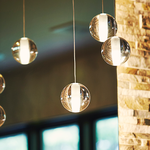 “I believe that all light fixtures are like jewelry, and you dress a space like you would with jewelry,” Hendrix says of how these and other light fixtures were used to complement the design. “One of the things everyone likes to do when the homeowners entertain is belly up to the island,” Adkins says. “People sit there and talk while they cook. Basically it’s a nice area where everyone can sit and hang out and just really have a good time.” Designed by Hendrix, that island features a waterfall edge and a floating stone kickboard. That and other elements were challenging to execute, which Adkins did through means such as incorporating steel into the structure. 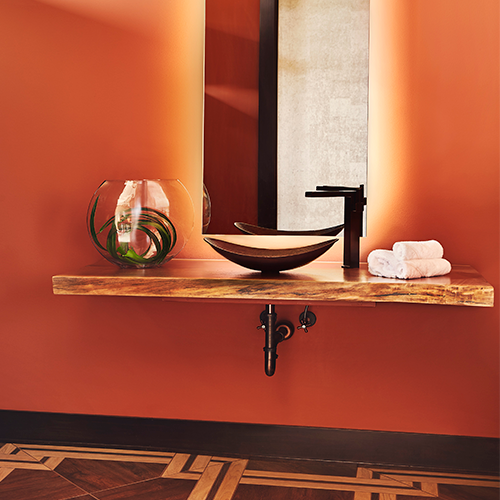 Featuring a bold, dramatic geometric pattern, specialty Italian tile is a striking feature in the powder bath. “It just jumped off the page at me,” says Hendrix of the dazzling flooring. 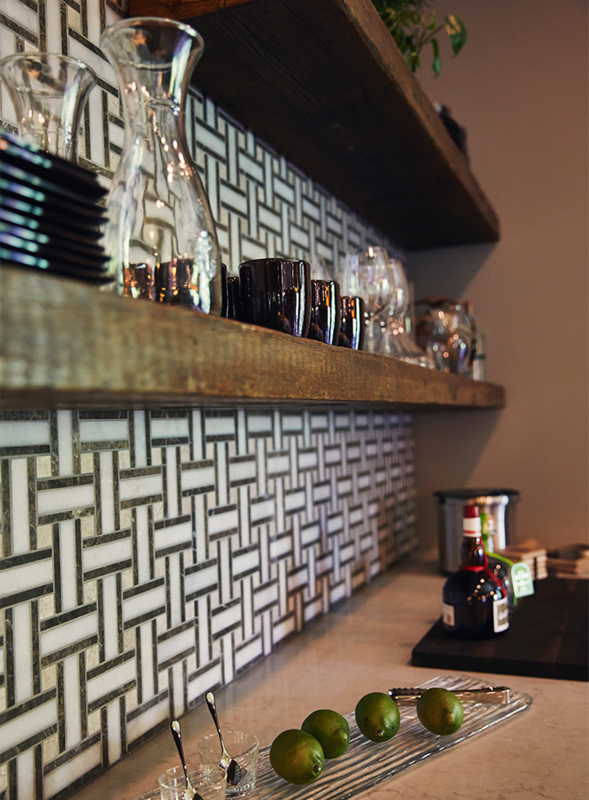 Imported from Italy, the tile took many months to arrive, and was particularly challenging for Adkins to lay out. “It was worth waiting for,” Hendrix says. 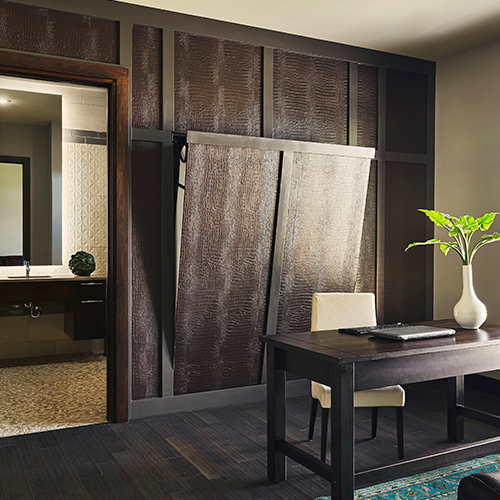 Thanks to a Murphy bed tucked behind a raised-panel design, this stylish space is both an office and guest bedroom. “The Murphy bed was definitely a challenge,” Adkins says. “The idea was to basically conceal that for everyday life.” The homeowners’ daughter is in a wheelchair, so it was important to them that this and other rooms of the house be handicap accessible and wheelchair friendly so that all guests are comfortable. The project includes rich details that were carefully chosen for maximum impact. For example, the team invested in a luxurious faux-crocodile wallpaper to blanket the wall that conceals the Murphy bed. “We spent money on wallpapers that were incredibly beautiful,” Hendrix says, citing the real cork on the walls in the entryway as another impactful selection. The large, spa-like bathroom features clean, simple lines, which are complemented by materials that give the space dimension, depth and texture. For example, one wall has warm, rustic stacked stone, while another includes a combination of tiles, such as one of small interlocking hexagons. In keeping with the sleek, modern style on display throughout the house, most of the main features in the master bathroom are simple and neutral, with small touches giving the space a little extra flair. For example, Miller selected this group of eye-catching orbs to reflect the glow of the back-lit mirrors. A young, active couple, Danny and Maddy Scanio dreamed of having the perfect setup for hosting loved ones, whether for watching a Cardinals game, playing pool or simply having a meal together. So in 2015, the pair sought out Mike Harkins of Harkins Construction to make that dream a reality. The first step was finding the perfect location—a cul de sac lot on Rivercut Golf Course’s 12th tee—and orienting the floorplan. “The biggest thing to overcome was getting that house on a cul de sac lot where it would be turned to face the fairway and get the views that they wanted,” Harkins says. 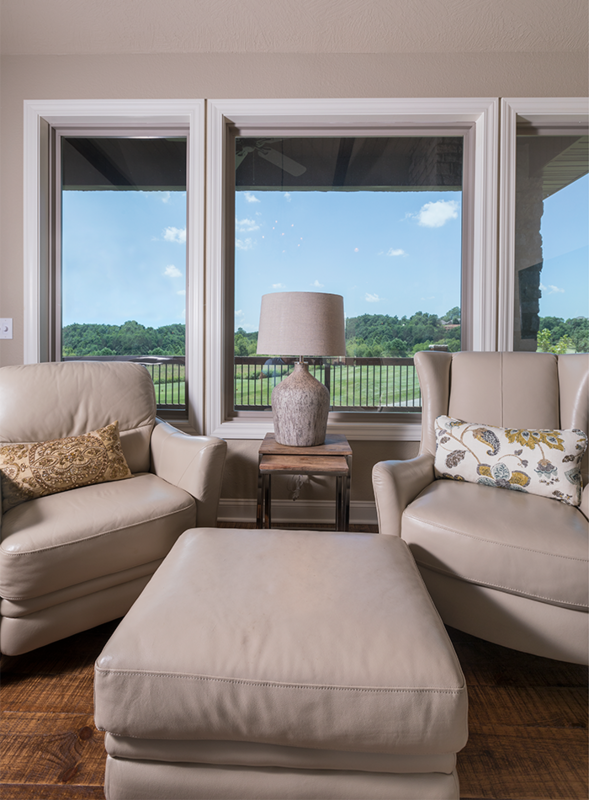 Those views take center stage throughout the home. Tall windows frame the landscape in the open kitchen and great room. 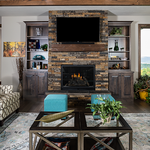 Those vistas, together with grand features like a floor-to-ceiling stone fireplace and rustic wood beams, set a striking scene. “It has a very impressive look,” Harkins says. 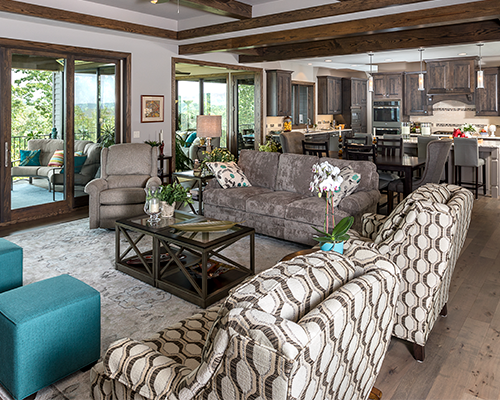 When entering the home, guests see the great room as one of the first areas to come into view. 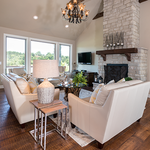 Uniting the kitchen and dining room in an open floor plan, the showstopping space has several standout features, including a 16-foot-tall stone fireplace, rustic beams stretching across the ceiling and large windows looking across the deck and golf course. 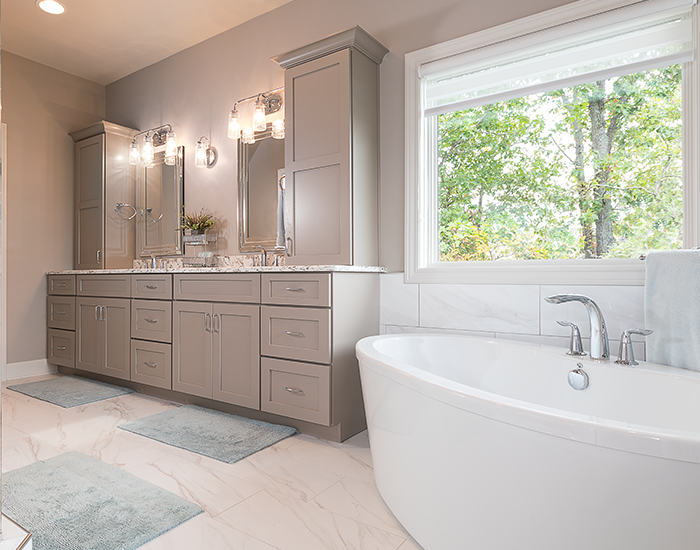 The soothing, stylish master bathroom balances style, comfort and function. For example, power outlets were installed in some of the drawers so tools like curling irons and blow dryers are ready to be used and cords can be conveniently tucked away. The shower features glass doors and floor-to-ceiling tile that resembles wood. 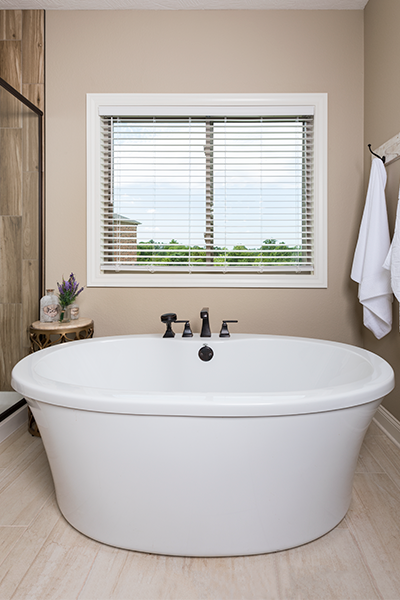 Nearby is a freestanding tub that’s perfect for soaking and unwinding from a busy day. 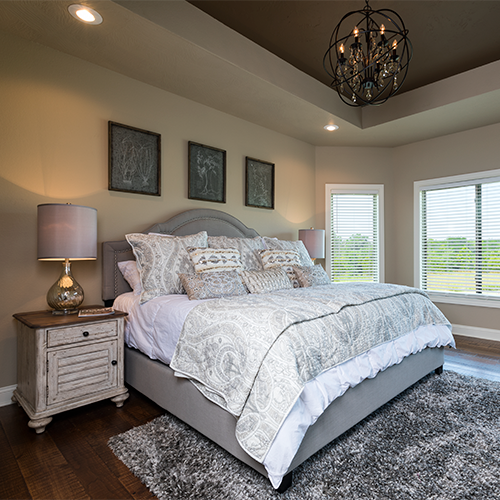 The richly decorated master bedroom is a restful retreat where the Scanios can escape and relax. A soft color palette serves as a backdrop for eye-catching details like a dramatic chandelier assembled from crystal and wrought iron. The same weathered hardwood flooring from the rest of the first floor extends into the bedroom. Stained and sanded to rustic perfection, the wood is coated with a clear veneer to smooth its surface. 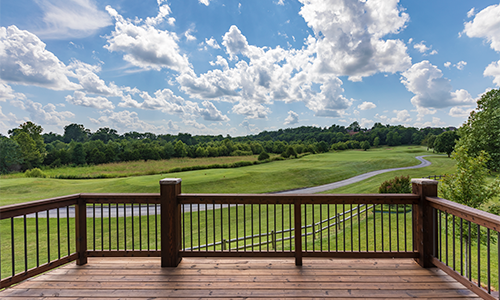 Overlooking the 12th tee box, the back deck is 20 feet long and extends 14 feet. 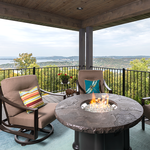 An ideal spot for eating or enjoying the scenery, the deck sits off the great room and has subtle embellishments like custom stone railing caps. Having a welcoming porch was a priority for Maddy. “That was one of the features that she really wanted right from the get-go, so the depth of the house and garage were determined to make that courtyard work,” Harkins says. Guests enter that courtyard by passing through an antique gate and under a stone archway as they approach a stunning wrought-iron front door that’s embellished with hammered glass. 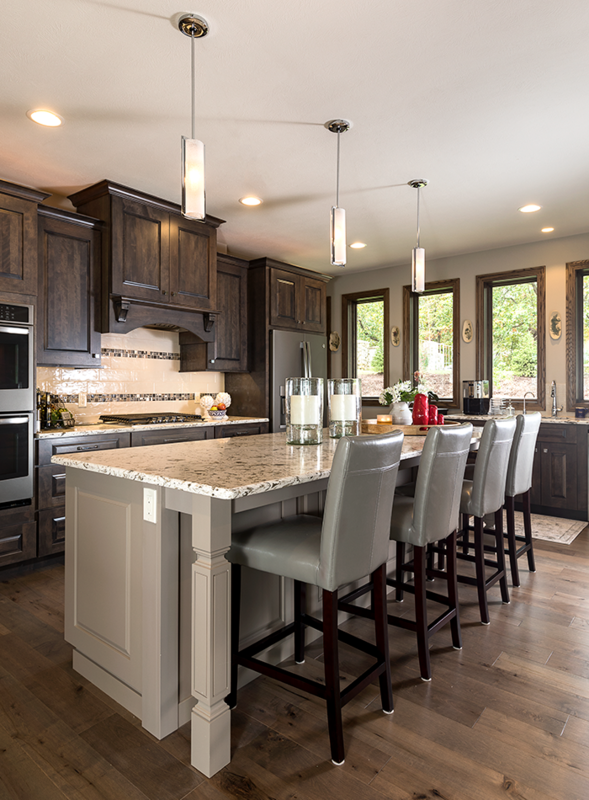 Thanks to a large island with a massive, curved granite countertop and plenty of seating, the kitchen provides a comfortable gathering place for guests. The striking countertop is contrasted by cabinets made from dark, knotty cherry wood. 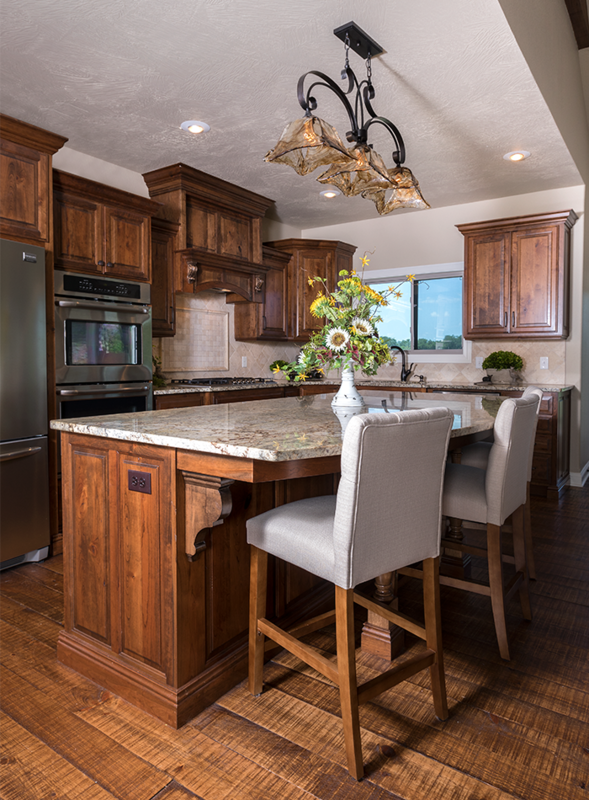 Those cabinets feature 4.5-inch crown molding, which further elevates the space’s elegance and sophistication. 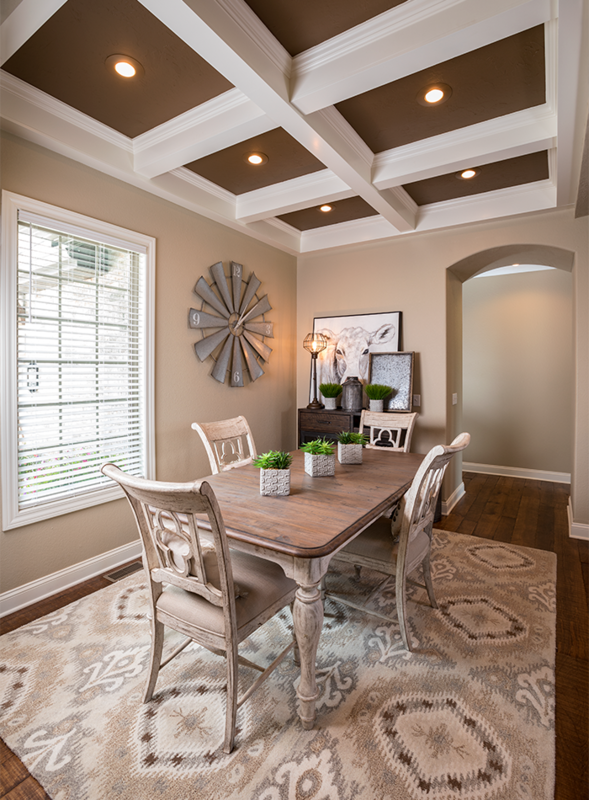 Harkins installed an ornate coffered ceiling that Maddy had selected and designed for the dining room. One of Harkins’ favorite features in the house, the decorative ceiling gives the warm, inviting space additional visual interest and depth. “It’s different from anything I’ve ever done, and it turned out really well,” he says. Maddy’s mother, Cindy Yates, who owns Springfield’s La-Z-Boy Furniture Galleries, helped the couple flesh out the home’s interior design, which strikes a balance between Old World elements and youthful, modern touches. For example, a large-scale pocket watch clock adds a touch of whimsy, while the great room’s leather furniture has a soft, neutral color palette, allowing other elements like the ceiling beams and hardwood floors to shine. 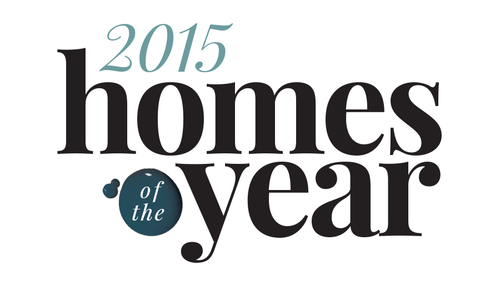 417 Home: How did you choose this contemporary, prairie-style design? Thom Holman: Mickey, the homeowner, loved the contemporary look of some new homes, but didn’t want to go completely contemporary. So Jason Thompson and I worked together to come up with a mixture of that prairie style, which is a little bit of what they had before, and then bringing some contemporary features like dark windows into the equation. 417: What challenges came up during this project? T.H. : The steepness of the lot caused [challenges] not only in setting the house in and actually digging for the concrete foundation, but everything that happens on the backside of the house, from putting on siding to installing windows. You’re off the ground 30 to 40 feet. 417: What did you learn during this project? T.H. 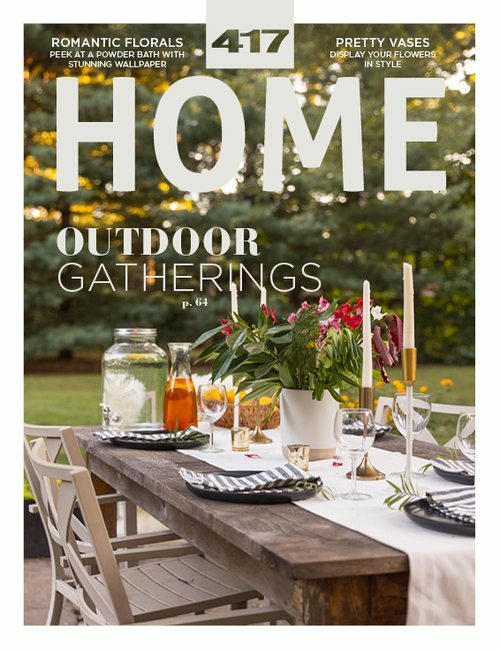 : We went for 20 years building traditional–, French Country– and Craftsman–style homes. When somebody starts to talk to me about a house, my mind immediately goes to those styles and to colors I’m used to and I like. This house made me rethink how to be open to what customers are saying. Rather than falling into the trap of what I like and guiding them when they don’t know what they want, I like opening up to new ideas, materials and ways of doing things. 417 Home: Talented people were essential to this project. How would you describe the team that worked on this house? Justin Adkins: It was a family of subcontractors. They are all craftspeople. I mean, they are artists. 417: What is your favorite room or feature? J.A. : Probably one of my favorite features is the walnut top in the half bath upstairs. I think that was really cool. It was harvested here locally. We had some Amish [craftsmen] build that for us. And the kitchen turned out just amazing. 417: What were your takeaways from this house? J.A. : Basically, to search for new ideas—to look outside of the box and think of things that someone hasn’t done before. Everything has been copied and done it seems like at this point, or at least we all think it has been. So honestly, just being able to search for new materials, new finishes and new ways of doing things that are different. 417: How did you make the home more energy efficient? J.A. : The whole house has radiant floor [heating]. It’s split into three zones so you can basically control the temperature in the main common area, the master suite or the guest areas of the house. So they can keep their sleeping spaces comfortable, for example, versus unused areas of the house. 417: What were some challenging aspects of this project? Keith McKee: This was probably the most detailed house we’ve ever done. So, I would say that was probably the biggest challenge. 417: Finding sources this home’s more unique elements was another challenge. How did that affect the process? K.M. : We had to wait on certain things to get in because they were coming in from all over the United States. They just weren’t here in Springfield. So trying to get things ordered and making sure they came in on time. It was a lot of phone calls! 417: What are you most proud of from this house? K.M. : [The style] is different than what we are used to building. So I think to me, it was just fun because it’s nice and challenging to do something different. I can’t say that I am most proud of one certain area; it’s more that I enjoyed doing something different. K.M. : This was probably the most detailed house we’ve ever done. So, I would say that was probably the biggest challenge. 417: Finding sources for this home’s more unique elements was another challenge. How did that affect the process? 417 Home: What was the biggest challenge you encountered during this project? Mike Harkins: It’s a cul de sac lot, so it’s very tight in the front and big in the back. So we tried to get the most footage we could. I worked with an architect and the Scanios to come up with a plan that would sit on that lot and be turned where they were going to be able to see down the fairway from the majority of the house. M.H. : My biggest thing is seal off any air penetration. We do a combination of blown insulation and Isolene insulation where we seal off all of the pipes and wires and anything that goes to the outside, and all doors and windows. And of course we use the high-efficiency furnaces and air conditioners. With the difference that you pay on the high-efficiency furnaces, they more than pay you your money back. 417: What is the most gratifying part of building? M.H. : The satisfaction of hearing “that’s exactly what I had in my mind” when you are trying to take a home from paper or an idea. 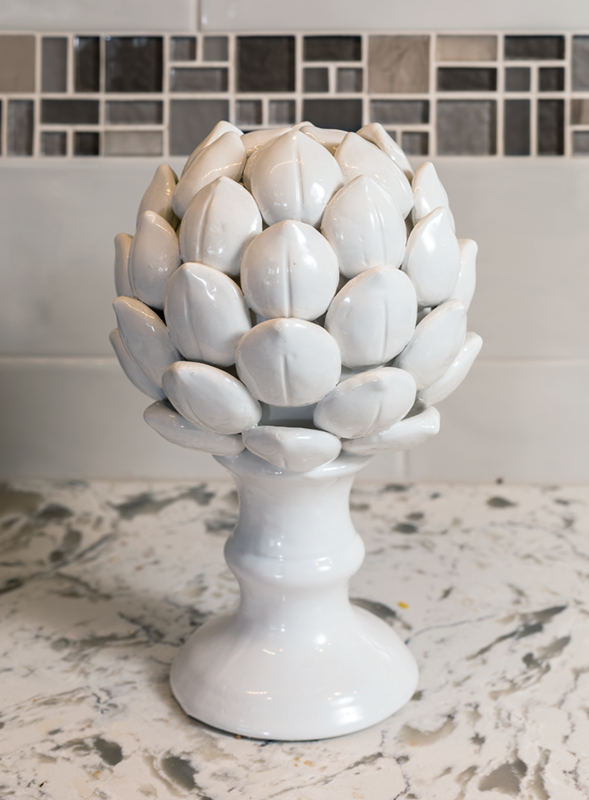 The homeowners have a visual of what they hope it looks like, and to hear them go “oh, that’s exactly what I had in mind” and how much they love the pieces, that gives you a good feeling. 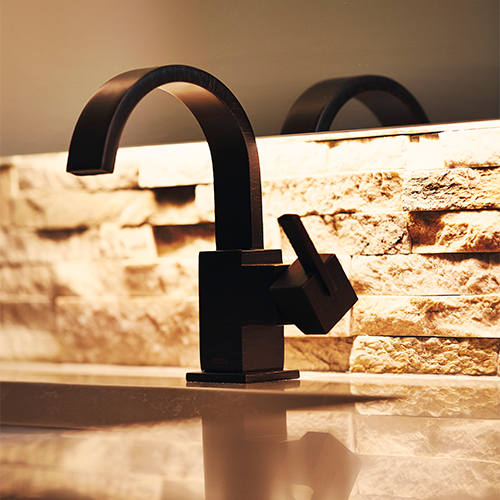 With a custom build, the design possibilities are endless, but the process can seem daunting. 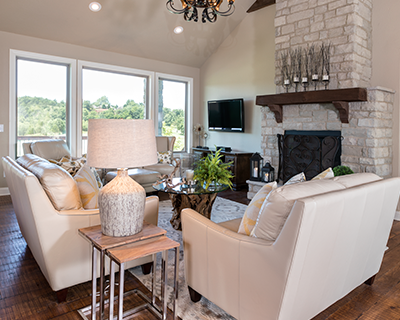 We talked with custom home experts to shed some light on how to have a successful project that results in the home of your dreams. 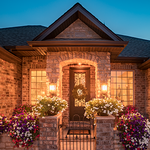 To select the right professionals, builder Rick Ramsey of Ramsey Building Company (201 N. Main St., Nixa, 417-725-5545) recommends reviewing builders’ portfolios and asking for current and past clients that you could speak with. “It’s important to know that they’ve got a good overall track record with customers,” Ramsey says. If your team includes an interior designer, Arianna Stanley Mueller, an interior designer with Slone Architects (1200 E. Woodhurst Dr., Suite J-100, Springfield, 417-887-4575), advises including them in the early planning stages. “Whether you are remodeling or if you are doing a new construction and building from scratch, including your interior designer in the planning stage makes sure that the whole team is on the same page design-wise from the very beginning of the project,” she says. 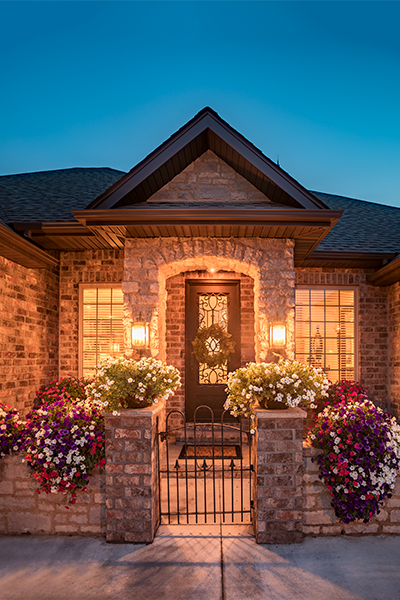 Use sources like Houzz, Pinterest and magazines to share concepts you like with your builder. “Gather information that would help me to better understand some of the things that you like and why you like them,” Ramsey says. Talk openly with your team about the financials of the project and be sure to leave a little budgetary wiggle room for any changes or additions that may arise down the line. “What I would recommend is, on the budget estimate process, that there is area of cushion,” Ramsey says. Allow your team the time to carefully consider every aspect of the project before jumping ahead. “Plan enough time for planning,” Mueller says. “A smooth project is a well-planned project. And a budget-friendly project is one that makes changes on paper, not in the field. It’s a lot less expensive and time consuming to move a wall on paper than it is to move one after it’s been built." Your priorities may affect the progression of the project and the order of the steps that need to be taken, so highlight the features or elements that are most important to you. “If you know from the beginning that you have found the most fabulous bed that you will ever find in your life, and you absolutely want that one, the benefit of working on a new construction home or even a remodel is that you can custom tailor that room to that piece of furniture,” Mueller says. Meet the members of the Home Builders Association of Greater Southwest Illinois we asked to judge the contest. David Padgett started working summers as a laborer when he was a teenager and became full-time in 2007. He has taken on the responsibility of carrying the family-owned business that has been serving the St. Louis–Metro area since 1992 into a second generation. Padgett oversaw remodeling projects on two air force bases and after that success, became General Manager of the company in 2011. 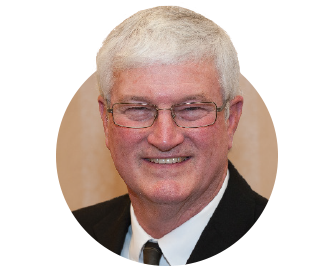 He was introduced to the HBA of Greater Southwest Illinois as a child through his father and is now currently serving as the president. Joe Lanahan grew up with a hammer in his hand. Working with his father since 1967, he learned subdivision development, heavy equipment operations and residential home building. In 1982, he began his own construction company, building light commercial and custom residential homes. In Lanahan’s 35 years he has been a pillar in the Troy Community and in the building industry in Madison and St. Clair counties. 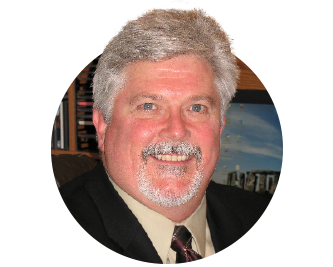 Lanahan has been a member of HBA since 2007, serving on the Executive Board, Board of Directors and currently as First Vice President. Mark Vogt, owner of Vogt Builders, specializes in new homes, land development and remodeling. 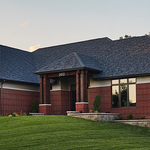 Building homes for over 30 years has made Vogt Builders a trusted residential developer and home builder in Waterloo, Illinois. Mark’s high level of involvement within the community and the HBA is indicative of his character and reputation. 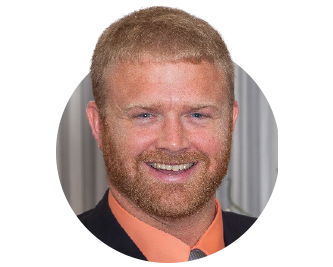 Mark has been a proud member of the HBA of Greater Southwest Illinois since 2002, served as 2010 President and currently holds the title of Officer Representative Director.